Bought for a Christmas gift. Receiver loved it. The actual item colors seemed a little bolder than in the picture. The colors in the picture seemed softer. 100% Acrylic size:55 x 55 Comfortable and Soft, Warm and Stylish Hand wash. Lay flat to dry It is oversized blanket scarf ,super soft and warm. Such a pretty scarf. Love the colors and feels soft. My husband purchased this for me for Christmas. It is very nice and warm but leaves lint everywhere and on everything! Before I washed it and even after I washed it a couple of times. Lovely! Large and warm. Pretty colors. Gave this as a gift, great quality! She loves it, doesn't go anywhere without it! Great price! It shipped very quickly but the scarf doesnt look exactly like the picture. It is very pretty though. poor quality. The material is very thin and looks very cheap. It really started falling apart on the second day. I great Christmas gift. It came quickly and looks really nice!! 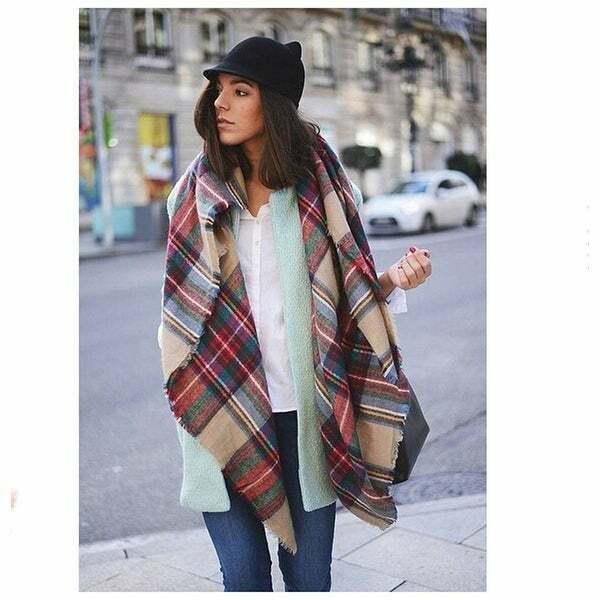 Women Plaid Blanket Shawl Scarf for Fashion Wear & Winter - 56" x 56"